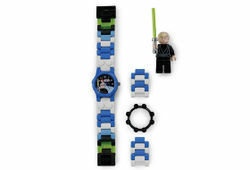 W006 LEGO Star Wars Luke Skywalker Watch is a Star Wars watch released in 2007. This set contains a watch with a Luke Skywalker Minifigure. Facts about "W006 LEGO Star Wars Luke Skywalker Watch"